A group of researchers at MIT's Computer Science and Artificial Intelligence Laboratory (CSAIL) are working with machine-learning startup PatternEx to develop a line of defense against such cyber threats. 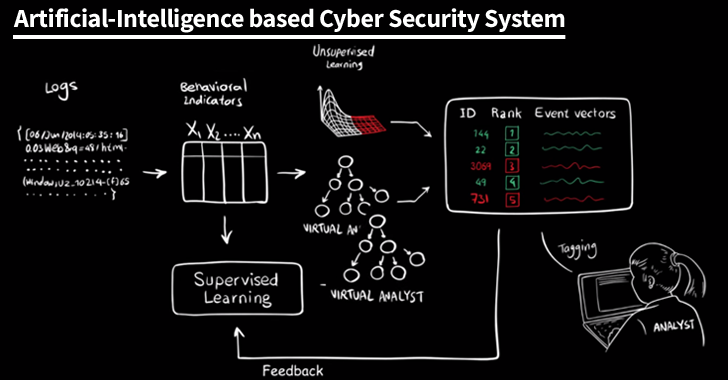 The team has already developed an Artificial Intelligence system that can detect 85 percent of attacks by reviewing data from more than 3.6 Billion lines of log files each day and informs anything suspicious. The new system does not just rely on the artificial intelligence (AI), but also on human input, which researchers call Analyst Intuition (AI), which is why it has been given the name of Artificial Intelligence Squared or AI2. The system first scans the content with unsupervised machine-learning techniques and then, at the end of the day, presents its findings to human analysts. The human analyst then identifies which events are actual cyber attacks and which aren't. This feedback is then incorporated into the machine learning system of AI2 and is used the next day for analyzing new logs. "The more data it analyzes, the more accurate it becomes." In its test, the team demonstrated that AI2 is roughly 3 times better than similar automated cyber attack detection systems used today. It also reduces the number of false positives by a factor of five. You can also watch the video for a quick overview of the way AI2 works. According to Nitesh Chawla, computer science professor at Notre Dame University, AI2 "continuously generates new models that it can refine in as little as a few hours, meaning it can improve its detection rates significantly and rapidly. The more attacks the system detects, the more analyst feedback it receives, which, in turn, improves the accuracy of future predictions – that human-machine interaction creates a beautiful, cascading effect." The team presented their work in a paper titled, AI2: Training a big data machine to defend [PDF], last week at the IEEE International Conference on Big Data Security in New York City. So, let's see how AI2 helps create The Internet the safer place and how long it will take to be implemented into large-scale security platforms in the near future.